His parents can recite the days from memory. What parent couldn't, for such watershed trauma in the life of a boy and his family. On September 4, 2008, they found out he had a tumor in his brain. He was in the intensive care unit, often screaming in pain, until September 13, when he was transferred up to Unit 35. That stay lasted until September 18. He had the PICC line, a catheter he carries inside of him, inserted then. Every time he comes back here, they plug it into something. Sometimes it's an IV on a wheeled stand, dripping saline. Other times, it's feeding him chemicals - poison, fundamentally. His dad, wearing jeans and a weather-beaten NBA Live 2003 t-shirt, pushes this rack, hand on his 7-year-old son's shoulder. They are here, in Portland, Oregon, at The Children's Hospital at Legacy Emanuel, to begin another battery of chemotherapy. This time will be the "B" treatment in the cycle; it makes the hair fall out. And worse. The pair enter a cheerfully painted room and sit down at a long counter. They pick up Xbox controllers. Lego Star Wars fills the room with its cartoon explosions, jingling studs, babbling minifigs. It's 2:20 p.m., August 4, 2009, and Joe Evans is, in this moment and for however long it lasts, having a normal childhood. "We just hear the happiness," Joe's mom, Susan, 47, says as Joe and his 10-year-old brother, Will, tear through Lego Star Wars and Mario Kart on the GameCube. "It's a chance to have peace of mind, and for the little guy, it takes away, maybe, that knowledge of the poison going through him." Joe, his family, and the hospital are themselves one amongst the community served by Child's Play which, in its three year existence, has emerged as something of the gamers' charity. Despite living a lifestyle often associated, by non-gamers, with basement-cloistered self-absorption, gamers have pitched in to the more than $1.4 $3 million donated since Child's Play's establishment in 2003. More than $18,000 worth of video games, consoles and peripherals have come to Emanuel Children's Hospital since 2006. But the story doesn't stop with the numbers, even though so often it does, typically during a routine mention of a fund drive, often during the holidays. The games serve a therapeutic need that professional staff describe as increasingly critical. The charity is a pipeline of donations that keep games free from the critical-needs scrum of a hospital foundation's funding process. The experience is more than entertainment or diversion for the patient - it provides a family activity, a way for children to support and be with siblings in circumstances frightening to them as well. And though Joe Evans is just one gamer, and Emanuel Children's is just one hospital, in many respects their story is representative of the more than 60 hospitals in the Child's Play network, and of the thousands of patients who have received donations of video games and consoles over the past decade whatever their source. The contribution may be a single $50 title, but the gift is actually something else. "It gives them a time to just be a kid, which is really hard to do, sometimes," said Jen Usinger, a child life specialist in Emanuel's Child Life Program. "An awful lot of their time here, they're being poked and prodded, they go through surgery, or they're sick and feeling horrible, and to get a moment and play video games, and just be a kid, is huge." In a sadly ironic way, perhaps nothing certifies video games as a childhood more than the Star Lounge of Emanuel Children's Hospital, where the lives children lead during their stays are far from normal. Here they enjoy "Game Crazy" every Wednesday night, playing Mario Kart or Super Smash Bros. Brawl on the big screen TV. That said, their gaming experience here is, likewise, not anything they'd typically find at home. In a room looking high over the Columbia River and downtown Portland, kids can come here if they want, whenever they want, as late as 10 pm. The relaxed decoration and furniture arrangements, chill-out color schemes and a mini-theater with rolling easy-chair seating, do their best to wash that realization away. Because outside, the reminders of what they can't do are plentiful. "The boredom of being in here, and tied to that IV, with the PICC line in, is something not a lot of people can understand," said Joe's father, Pat, 47. The family is from nearby in Portland. "Especially in the summer. There's no swimming, there's no camping, none of the things the family usually does. You can't have a lot of people around because of the fact his white-blood cell count [which affects his immune system] is low." With the purchase of a Wii for Christmas 2008 ("I just couldn't say no," Pat said) video games are now a significant part of the family's life away from the hospital, moreso when Joe's in it. The Evanses have eight children (two adult) and four systems - Wii, Xbox, PlayStation and GameCube - and Christmas 2007 delivered three more Nintendo DSes, one of which Joe brings to the hospital. And during that first stay in September 2008, games became a talisman of life before the diagnosis. "In the ICU, they had this roll-around cart with systems, and you could pick games to play from it," Pat Evans said. "Even though there could only be two people in his room at once with him, I'd leave and bring one of the boys in, and they'd play. "When we came into the regular ward, here, it was just him and his brothers, and first thing, they wheeled him down here (to the games lounge), with his IV in," Pat says of his son, a typically shy youngster around others, but boisterous in the company of his family. "Maybe it only lasted half an hour, but it was a big deal." Video games represent such normalcy for kids that, Usinger says, when they don't want to play them while at the hospital, parents get concerned. But more typically, Usinger said, a parent's instinct is to believe that a sick or injured child should be bedridden and spending all of that time recuperating, not playing. "Sometimes kids need to be kids, so that their body can heal and function as normal," Usinger said. "If we didn't have video games here, we'd be at a huge loss, especially with kids who are older or of middle school age. It's important that we meet them where they are in life." Usinger, who has been with Emanuel's Child Life program for all of her career going back to 2001, and is both a psychologist and trained specialist in her field, puts her job in the big picture. "I help kids cope with being in the hospital," she says, "and it's a pretty big umbrella." Never in her studies at Eastern Oregon University did video games come up. Mostly it was the psychology of a child being examined, injected or treated for the long term, and how to help him or her cope with it - a difficult enough preparation for an adult patient, let alone someone younger than 10. But Usinger recognizes the usefulness of familiarity, whatever it is. "This is what kids do. This is what teenagers do with their sedentary time," Usinger said. "They watch TV. 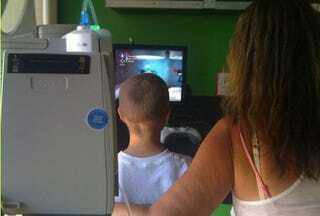 They play video games." Rare is the patient who does not play video games, she says - and in that case, the games the hospital does provide become a novelty, almost a bonus, in a long-term stay. "In the beginning, we had about five Game Boys that patients could check out, and we had a couple Nintendo 64s for in-room use," she said. "Over time, from 2001 to now, there's been a huge change in the use of video games, across the board. It's essential to have them now. It's a rarity that I'd have a teen who wants to play a board game." The Star Lounge itself demonstrates the lengths the hospital goes to indulge its patients' interests and hobbies, on their level. This is where console gaming happens, where DVD parties take place, where group play on the Wii is organized. Wednesday from 6:30 to 8 p.m., the Wii is hooked to the lounge's 60-inch HD television set. It's, of course, an extremely popular console, so its usage is normally during group occasions. There are only 14 Miis on the console, eight boys and six girls. Putting a Mii on the console is unusual; it's only put in a child's room if they've spent a prolonged amount of time there or otherwise can't play in the Star Lounge. Or sometimes, they may have it for special occasions - such as an end-of-chemo party. Emanuel Children's Hospital got its Wii in 2006, shortly after its launch, and shortly after the hospital joined the Child's Play network, in time for the holiday surge in donations. Child's Play, among benefactors, is perhaps uniquely attuned to its beneficiaries' needs. Both Usinger and Lynn Hallbacka, the Development Officer for the Emanuel Children's Hospital Foundation, praise the fund for delivering titles that aren't merely functional and age-appropriate, they're current, and ones their patients want to play. It's not to say that the hospital's foundation wouldn't have the money to make such purchases for itself. But having such things placed in the care of a third party — donors who know what they're doing and give every year — frees the hospital to focus its attention on larger goals. "Because our fund-raising department is not terribly large, if we did not have this relationship, I don't think we'd be making a specific effort to solicit games," said Hallbacka, who specified the Children's Hospital foundation's two major fundraising pitches as "hard dollars, and stuffed animals." Furthermore, the influx of Child's Play donations keeps video games and entertainment outside of Emanuel Children's Hospital's budgetary process. Like many hospitals, Emanuel Children's is part of a larger system, and every year, all constituents submit grant proposals, which are prioritized and turned in for approval to an overall controlling board. This year, Legacy Emanuel is in the process of building a new, $250 million children's hospital building, the top priority across the entire system. It's hardly the time to be writing proposals for video games, which, no matter how small the dollar amount, could be trivialized or lost in the shuffle of the grant process. "Given all of these other priorities, maybe these games would not be at the top of the list," Hallbacka said. The price tag and priority of normalcy is hard to quantify, much less put up for board review. These games might provide bursts of it, everyday experiences in an otherwise traumatic chapter of life for child, mother and father. But as grateful as she is for them, in the end Susan Evans hopes Joe's time here becomes as nondescript and memoryless as the times we've all had playing games growing up. Because, really, among us who can remember exactly what we were playing when Mom or Dad told us to put down the controller and called us in for dinner, or to scrub up, set the table, or stop tormenting our brothers or sisters. Or before the doctor came back into the room. Or the nurse fixed up the tubes. Or the poison flowed and brought on the sickness. In a mind so young, maybe these, too, can someday be taken as just interruptions of life that might have cut short, but weren't the context for, the time spent being a kid. "Hopefully," Susan Evans says, "this will all be faded memories when he's older."